Impressive, isn’t it? You can practically smell it steaming on your screen. Hard to believe this object is Miocene in age, about 6 million years old. Here’s another similar specimen in a top view, if we can say that. And here’s a side view. Notice the rich color, long, parallel striations, and “pinched” ends. If these aren’t fossil feces, officially known as coprolites, they’re excellent imitations. They’ve been prime attractions in our first paleontology lab. These evocative objects are primarily made of siderite, making them dark and heavy. Our specimens above come from the Wilkes Formation (upper Miocene) in southwestern Washington state. They are enormously abundant and thus common in rock shops and museums around the world. In that is your first clue: how can feces with such exquisite detail be preserved so perfectly in such enormous numbers in so few places? My answer, along with many other geologists, is that these are pseudocoprolites made by inorganic means. Their extrusive nature and appropriate color gives us the illusion of poop. I’m highlighting these objects this week because a paper appeared last month in the journal Lethaia making a case that they actually are biological in origin. Broughton (2016), in a long bit of prose and analysis, concludes that the Wilkes Formation objects are a mix of giant earthworm “mineralized intestinal remains (Type 2)” and coprolites “from unknown vertebrates” (Type 1). I don’t buy Broughton’s interpretations, but found them fascinating enough to make his paper part of a reading exercise in my paleontology class this month. The most relevant references are below so you can do your own reading and decide what these curious extrusions (or intestinal casts) are. 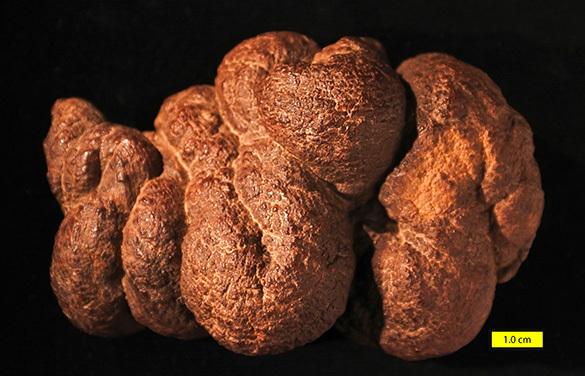 Let’s start with this excellent 2014 article by Brian Switek for National Geographic: “Was Six-Million-Year-Old Turd Auctioned for $10,000 a Faux Poo?” Yes, one of these curiosities actually sold for $10,370 at an auction … and it is over 100 centimeters long! (Check out the images in this NPR article on the auction. That would be an epic poop for anyone.) This auctioned specimen is an example of what Broughton (2016) calls Type 2; he believes they are essentially mineralized guts of really large burrowing earthworms. He makes his case by interpreting the striations as muscle fiber impressions, and the shapes as resulting from peristaltic motions inside the worms. (Seilacher et al., 2001, had similar ideas.) The smaller “faecal-like specimens”, like we have at Wooster, are his “Type 1”. As far as I can tell, only length separates Type 1 from Type 2 in Broughton’s classification and, as might be expected, “Some fragmentary Type 2 specimens may be misidentified as Type 1.” It is odd that Types 1 and 2 are identical in every feature but size, yet are given very different origin stories. Critical observations to keep in mind as you explore this mystery: (1) These siderite objects have no inclusions of organic material — not a seed, woody bit, or bone fragment; (2) There are no associated vertebrate skeletal remains or other traces, and no evidence for earthworms either; (3) They are incredibly abundant in limited horizons, and unknown elsewhere; (4) They range in size from a centimeter or less to over 100 centimeters long; (5) You’d think you’d find a few squashed, now and then, or burrowed by insects, but they are in spectacular three-dimensional preservation. I support the earlier interpretations of these excrement-appearing rocks as deformations of soft, plastic sediments by inorganic processes, as thoroughly developed by Spencer (1993), Mustoe (2001) and Yancey et al. (2013). They may have been extruded through rotting hollow logs by compaction, liquified by seismic activity, or squirted through cracks by natural gas emissions (which would be ironic!). That these pseudocoprolites were squeezed through something seems obvious; it is unlikely they came to us by way of animals. Mustoe, G.E. 2001. Enigmatic origin of ferruginous “coprolites”: Evidence from the Miocene Wilkes Formation, southwestern Washington. Geological Society of America Bulletin 113: 673-681. Seilacher, A., Marshall, A., Skinner, C. and Tsuihiji, T. 2001. A fresh look at sideritic ‘coprolites’. Paleobiology 27: 7–13. Spencer, P.K. 1993. 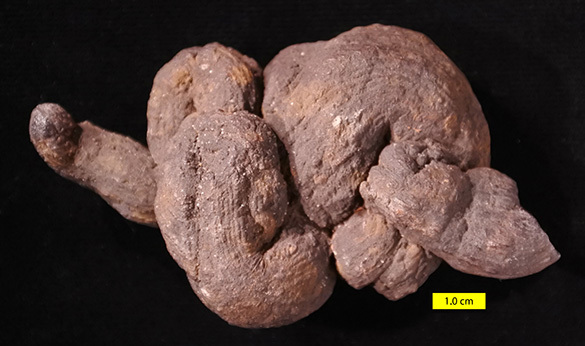 The ‘coprolites’ that aren’t: the straight poop on specimens from the Miocene of southwestern Washington State. Ichnos 2: 231–236. Yancey, T.E., Mustoe, G.E., Leopold, E.B. and Heizler, M.T. 2013. Mudflow disturbances in latest Miocene forests in Lewis County, Washington. Palaios 28: 343–358.